That is quite a blast from the past, some matches I don't have high hopes for but others look entertaining on paper. Let's get rolling. Nagai and Super Tiger II start things off. They circle each other to start. Nagai avoids Super Tiger II's kicks, waistlock by Nagai but Super Tiger II gets out of it and applies an armbar on the mat. They jockey for position but neither can get the upperhand and they return to their feet. Super Tiger II tags in Otsuka and Nagai tags in Fukuda. Waistlock by Otsuka, Fukuda reverses it into a hammerlock and then into a front facelock. Otsuka takes Fukuda to the mat and applies a side headlock, Fukuda gets back to his feet and pushes Otsuka into the ropes. Fukuda tags in Kurashima, waistlock by Kurashima to Otsuka but Otsuka tries him and the two roll into the ropes. Otsuka tags in Mashita, and Mashita kicks Kurashima while he is on the mat. More kicks by Mashita, he picks up Kurashima and pushes him into the corner. Mashita tags in Super Tiger II, kick by Super Tiger II, snapmare, and Mashita kicks Kurashima in the back. Knee drop by Super Tiger II, elbows by Super Tiger II and an Irish whip, and Super Tiger II hits a crossbody out of the corner. Super Tiger II applies a reverse chinlock to Kurashima and he elbows him in the head. Kicks by Super Tiger II, he picks up Kurashima and tags in Otsuka. Elbows by Otsuka, waistlock, and Otsuka applies an armbar. Otsuka tags in Mashita, and Mashita kicks Kurashima in the side. Mashita picks up Kurashima but Kurashima ducks the lariat attempt and applies a wristlock. STO by Kurashima, and we get an involuntary clip as Fukuda is now in the ring with Mashita. Fukuda hits a vertical suplex onto Mashita, cover, but it gets a two count. Fukuda picks up Mashita, chop by Fukuda but Mashita returns with kicks. A hard elbow by Fukuda sends Mashita to the mat and he tags in Kurashima. Kurashima picks up Mashita and goes for a piledriver, but Mashita blocks it. Karelin Lift by Kurashima and he tags in Nagai. Nagai punches Mashita and kicks him to the mat. Nagai picks up Mashita and hits a snap suplex. Cover, but Otsuka breaks it up. These two old Luchadors are no doubt going to do moves that I have no idea what to call. Just a warning. Solar and NOSAWA start things off. Waistlock by Solar, NOSAWA reverses it but Solar hits an armdrag. Tie-up, NOSAWA takes Solar to the mat but Solar quickly gets back up and applies an armbar. Armdrag by Solar and they are back up again. They go into a Test of Strength, waistlock by NOSAWA and he applies a side headlock. Solar gets out of it and hits an armdrag. Solar applies an armbar but MAZADA quickly breaks it up. Solar glares at MAZADA as he gets out of the ring before turning back to NOSAWA, chop by NOSAWA but Solar chops him back. They trade chops, NOSAWA picks up Solar, Irish whip, reversed, and Solar hits a spinebuster. Mexican Surfboard by Solar and he pins down NOSAWA for a two count. NOSAWA tags in MAZADA so Solar tags in Hamada. Hamada and MAZADA circle each other, tie-up, Hamada pushes MAZADA into the ropes and he gives a clean break. Single leg takedown by Hamada but MAZADA gets a hand in the ropes. Hamada applies a Fujiwara Armbar but MAZADA gets a foot on the ropes. Hamada picks up MAZADA and he takes Hamada in the eyes. Irish whip by MAZADA, reversed, and Hamada hits an armdrag. Hamada hits a cutter, and MAZADA rolls to his corner to tag in NOSAWA. Hamada tags in Solar, and Hamada elbows Solar to the mat. MAZADA comes in the ring too, double Irish whip to Solar to the corner and both wrestlers hit lariats. Another Irish whip to the corner and NOSAWA hits a lariat, MAZADA charges in but Solar drops him onto the apron. Solar chops MAZADA and slams him into the turnbuckle, NOSAWA throws Solar into the corner but Solar flips himself out to the apron. Solar knocks back NOSAWA and hits a legsweep. Tilt-a-whirl backbreaker by Solar and NOSAWA falls out of the ring. MAZADA attacks Solar from behind, Irish whip by MAZADA but Solar reverses it and hits an armdrag. Solar goes off the ropes but MAZADA rolls out of the ring. Solar then approaches the ropes and sails out on both NOSAWA and MAZADA with a pescado. Saito and Sekimoto circle each other, tie-up, Sekimoto pushes Saito against the ropes and he gives a clean break. Tie-up again, Saito pushes Sekimoto into the ropes again and again he gives a clean break. They go into a Test of Strength, Saito pushes Sekimoto to his knees, side headlock by Sekimoto, Saito Irish whips out of it and they collide with both men staying up. Sekimoto goes off the ropes but can't knock Saito over, they go back and forth but neither can get the other off their feet. Kick by Sekimoto and finally he is able to shoulderblock Saito down. Saito knees Sekimoto in the midsection, and Sekimoto rolls to the apron. Saito goes out to the apron as well, he picks up Sekimoto and goes for a suplex but Sekimoto blocks it. Saito jumps down and clubs Sekimoto in the back, he pulls him out to the floor and throws Sekimoto into the ring post. Saito removes the mat at ringside, he grabs Sekimoto and hits a piledriver (still on the mat). Saito gets back into the ring and Sekimoto slowly follows him, Saito picks up Sekimoto and throws him out of the ring again. Saito goes out after Sekimoto, he picks him up and throws Sekimoto into the ring post. Saito pushes Sekimoto against the ring post and he hits a lariat. Saito picks up Sekimoto and slams his arm hard into the ring post. Saito gets back into the ring and Sekimoto rolls back in as well, Saito picks up Sekimoto and chops him in the arm. Kick to the arm by Saito, he puts his arm against the ropes and hits a scissors kick to Sekimoto's arm. Sekimoto clubs at Saito but Saito hits him with a hard forearm shot. Back up, Saito hits an armbreaker onto Sekimoto. Saito picks up Sekimoto and hits another armbreaker, Sekimoto fights back with chops and he chops Saito into the corner but another hard forearm sends Sekimoto back to the mat. I had no idea that Saito was even still wrestling. AKIRA and Liger start things off. Tie-up, waistlock by AKIRA, Liger reverses it into a wristlock and applies a headscissors, AKIRA gets out of it and both men return to their feet. Single leg takedown by Liger and he applies a stretch submission hold. Romero Special by Liger but AKIRA gets out of it, another takedown by Liger but AKIRA reverses it with a hammerlock. Side headlock by AKIRA, Liger Irish whips out of it but AKIRA shoulderblocks him down. AKIRA goes off the ropes but Liger hits an armdrag takedown. Liger keeps the armbar applied on the mat, AKIRA struggles back up and Liger tags in Nakanishi. AKIRA gets away and makes the tag sadly to Saito. Kicks to the stomach by Saito but Nakanishi returns the favor. Eye rake by Saito and he chops Nakanishi in the back, but Nakanishi easily shrugs it off. Chops to the chest by Saito but Nakanishi chops him back. Headbutt by Nakanishi but Saito chops him in the back of the head and tags in AKIRA. AKIRA and Saito both yank on Nakanishi's leg, AKIRA grabs Nakanishi by the leg but Nakanishi kicks him off. Nakanishi elbows AKIRA against the ropes and tags in Liger. Liger throws AKIRA out of the ring, Nakanishi holds AKIRA and Liger hits a baseball slide. Liger then gets up on the apron and hits a cannonball down onto AKIRA on the floor. Liger throws AKIRA back in the ring and goes in as well, he waits for AKIRA to get up but AKIRA catches him with a dropkick. Liger falls out of the ring and AKIRA hits a baseball slide. AKIRA rolls Liger back in the ring and tags in Saito. Saito kicks Liger in the ribs, Irish whip, and Saito hits a spinebuster. Jumping senton by Saito, cover, but Nakanishi breaks it up. Leg drop by Saito and he drops an elbow onto Liger's throat. Cover, but Liger kicks out. Saito picks up Liger and elbows him on the back of the head before replying a reverse chinlock. Tie-up to start, Irish whip by Ishii but Okabayashi shoulderblocks him down. Ishii gets back up, elbows by Ishii but Okabayashi elbows him back. Okabayashi goes off the ropes but this time Ishii knocks him down with a shoulderblock. Ishii and Okabayashi trade elbows again, Ishii goes off the ropes but Okabayashi knocks him down with a shoulderblock and hits a scoop slam. Another shoulderblock by Okabayashi and Ishii bails out of the ring to re-group. Ishii gets back in the ring after a moment and they lock knuckles, Okabayashi pushes Ishii to his knees, headbutt by Ishii and the two trade chops. Ishii chops Okabayashi back into the corner and hits more chops but Okabayashi pushes back and chops Ishii to the mat. Okabayashi picks up Ishii and chops him again as they continue trading chops. This time Ishii gets the better of the chop battle, he picks up Okabayashi and hits a headbutt. Chops and elbows by Okabayashi but Ishii elbows Okabayashi into the corner. Headbutts by Ishii and he goes for a slam, but Okabayashi blocks it. Headbutts by Okabayashi and he goes for a slam, but Ishii blocks it. Scoop slam by Ishii, he picks up Okabayashi, snapmare, and Ishii applies a reverse chinlock. Okabayashi gets back up and headbutts Ishii, chop by Okabayashi but Ishii elbows him into the ropes. Ishii picks up Okabayashi and goes for a vertical suplex but Okabayashi blocks it. Okabayashi muscles up Ishii into a vertical suplex, Ishii gets up in the corner and Okabayashi hits a running chop. Irish whip by Okabayashi and he hits a lariat in the corner. Okabayashi goes off the ropes, Ishii catches him with an elbow, but Okabayashi powerslams Ishii to the mat. Okabayashi applies a crab hold to Ishii, but Ishii crawls to the ropes and forces a break. Okabayashi picks up Ishii and clubs him in the back. Okabayashi picks up Ishii and tries to put him on his shoulders but Ishii elbows out of it. Okabayashi goes off the ropes but Ishii ducks the lariat and drops Okabayashi with a release German suplex. Ishii picks up Okabayashi and throws him into the corner, chops and elbows by Ishii, Irish whip, and he hits a powerslam. Choshu and LEONA start things off. Tie-up, Choshu pushes LEONA back into the corner and he gives a clean break. Tie-up, side headlock by LEONA, Choshu Irish whips out of it and they collide with bot men still standing. Kick to the stomach by Choshu and he hits a vertical suplex. Choshu goes for the Scorpion Deathlock but LEONA quickly gets into the ropes to force a break. Choshu tags in Sakaguchi, and Sakaguchi elbows LEONA in the back. Choshu stays in, he pushes LEONA back towards Fujinami and Fujinami tags himself in. Fujinami and Choshu square off, wristlock by Choshu and he tags in Sakaguchi. Kicks by Sakaguchi but Fujinami catches one and trips Sakaguchi. Fujinami goes for a crab hold but instead applies a kneelock. Fujinami picks up Sakaguchi and applies a front facelock, and Fujinami tags in LEONA. Sakaguchi and LEONA circle each other, kicks by Sakaguchi and LEONA stumbles down near the ropes. Sakaguchi keeps away from LEONA and elbows him in the midsection,but LEONA applies a leg submission hold. Sakaguchi goes for a cross armbreaker but LEONA rolls out of it. Side headlock by LEONA but Sakaguchi rolls out of it and applies a hammerlock. Sakaguchi goes for a triangle choke but LEONA rolls into the ropes to force a break. Sakaguchi stomps LEONA and kicks him back, but LEONA drives Sakaguchi back into the ropes. Best Match: Tomohiro Ishii vs. Yuji Okabayashi. Not even close. While most of the matches on this event came across as exhibitions, or were just aiming for "solid", these two put on a very entertaining and well structured match. There was no overkill, no trading holds on the mat, no handshake, just two big guys hitting each other and trying to drop each other as hard as possible. From an in-ring perspective this match really saved the show as otherwise it would have been one that could be easily skipped. A great performance by both wrestlers. MVP: Tomohiro Ishii. Who knew a few years ago that Ishii would become one of the most entertaining wrestlers in Japan? He isn't big height-wise, but he has a lot of muscle and the fans in Japan have really come around to how good he is. He fights within his limits, he doesn't try to do anything he shouldn't be trying to do and everything he does has a purpose. This match showed that even when wrestling someone he doesn't have a lot of familiarity with, that he can still put on a great match. Overall: As I mentioned above, Ishii/Okabayashi really saved the show. Without them it would have just been a middling indy event with some solid matches but nothing that you would need to go out of your way to see. 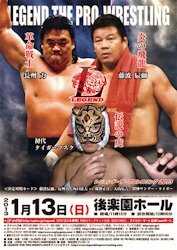 There was some nostalgia here, and if you loved one of the legends wrestling then it would probably be worth watching (I'd watch just about any event with Mutoh or Liger on it, and I am sure somewhere in the world there are fans that feel the same way about Fujinami and Choshu), but in terms of in-ring action everything hovered around the middle. Except for of course Ishii and Okabayashi. If you are on a nostalgic trip or want to see the one great match, pick this up, but as a whole I can only slightly recommend it because it really is just a one match card.